Do you dream? In color? Black and white? Do you remember your dreams? Are they pleasant, or harrowing? I’ve sometimes laughed so hard at some event in a dream that I wake my husband and myself. I’ve also catapulted into consciousness with the fast breathing and panic of the pursued. My therapist insists we make our dreams. But I knew a woman who believed her dreams offered warnings from some unseen force—and, uncannily, it seemed the case. At a recent reading, the poet Howard Schwartz spoke about keeping a dream journal and how those captured images inform his work. I’ve sporadically tried keeping a journal as well. Although I’ve never stayed with it more than a month at a stretch, I’m always surprised at how much I’m able to recall—and describe—when I follow this discipline. So it was with particular interest that I attended a guided tour at the Pulitzer in St. Louis titled “Dreamscapes.” This exhibition includes diverse works from artists such as Roy Lichtenstein, Joan Miro, Brancusi, Chirico and others. Among my favorites were two installations by Janet Cardiff. In both of Cardiff’s pieces, one picks up the receiver of an old-fashioned phone and hears Cardiff—sounding as if she’s only half emerged from a drugged sleep—recounting a complex dream. Each phone plays a different dream; each recording manages to place the listener immediately (if voyeuristically) inside the experience. The effect is intimate and disorienting. As a writer, I particularly enjoyed hearing someone tell me a story, and then letting my imagination take over. I also enjoyed being able transgress the museum’s ever-so-vigilantly enforced “you must always stay at least three feet from the art” rule. Although our group was small, and comprised of seemingly well-behaved adults, the gallery assistants scrutinized our every move for the opportunity to warn us away from the art. It was obvious they enjoyed their work. Two women in our group (I was one of them) were upbraided for daring an eighteen-inch proximity. My tour-mate reddened and was clearly offended when corrected. I opted to see the interaction as my own surrealist experience: a kind of unannounced performance piece by the Pulitzer to imbue our collective dreamscape with ubiquitous guards. One of the most dramatic pieces in the show was a red fabric stairway by the Korean artist Do Ho Suh. Part Disney hologram, part Cristo for interiors, part outtake from “The Shining,” the staircase descended to several feet above the museum floor. Its handrail was missing. Some in our group wondered at the significance of the absent rail, the red fabric, and the stairs that remained out of reach. A few insisted the work could only have been achieved with a CAD drawing program. 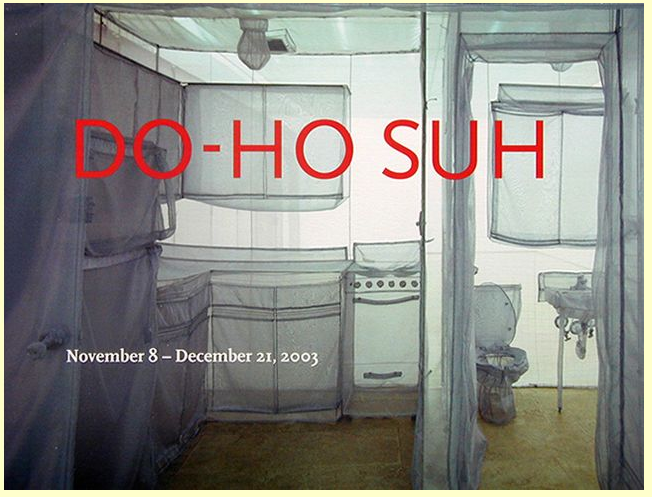 Then our guide informed us that Suh’s pieces are 3-D recreations—in sheer colored fabrics—of places he’s lived. These fabric sculptures are sewn by master seamstresses in Korea, based on Suh’s exacting instructions and include the interiors of his past homes—down to details such as knobs on a kitchen stove. This new knowledge completely transformed my reaction to the art. I thought of Proust’s Madeleine or the contents of Tim O’Brien’s infantry pack. The staircase transitioned from symbol to obsession—an idea that was only reinforced when our guide told us that Suh’s entire 3-D fabric apartment is designed so that it can be folded into a suitcase and carried with him. Place is important in writing. In my own dreams, I often revisit a particular place from my history. Each time I find myself back there, the events that occur are predictable and upsetting enough that they often wake me. The idea of literally carrying that place with me both fascinates and repels. Imagine an entire apartment—a place important to you for whatever reason—created, then folded away into a suitcase you carry with you. The weight of memory, the weightlessness of dreams. This entry was posted in Uncategorized and tagged Brancusi, CAD, Chirico, Cristo, Disney, Do Ho Suh, dream journal, Dreamscapes, hologram, Howard Schwartz, Janet Cardiff, Joan Miro, Memory, Pandora, performance art, Proust, Pulitzer Foundation for the Arts, Roy Lichtenstein, Tags: Dreams, The Shining, Tim O’Brien. Bookmark the permalink.